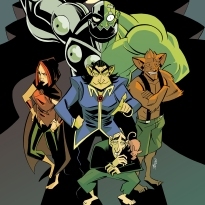 Have you read Ghoul Squad #1? Send your thoughts, comments, prayers, or threats to fanreviews@thehigheruniverse.com. Be sure to include your name, where you’re from, and write “okay to print” in the subject line. Felt like the perfect blend of dark comedic characters and high octane action. Loved this book from start to finish. Definitely want more. Just read Ghoul Squad #1 from @BrandonRhiness. A well put together book & a fun read! I recommend it. That was a fun, ‘we’re going to the pub’ classic! Carlos Trigo’s stuff always looks great, suited the story really well there! I hope the comic becomes very popular quickly as I think it deserves it.